Store, transport and protect up to eight 82mm filters with the made in the USA, Realtree Max4 FilterPouch 8 from LensCoat. The FilterPouch is designed as a standalone item, or as a matching accessory for other LensCoat gear. Photographers will appreciate the rapid access, slip-in design, clear PVC pockets for easy ID, and shock-absorbing neoprene construction. Carry the pouch inside a pocket, camera bag, or wear with the rear belt loop. The Realtree Max4 design features a wide variety of plant-like patterns that mesh well with trees and vegetation commonly found in wetlands. This makes it well-suited for hiding from birds and other types of wildlife. 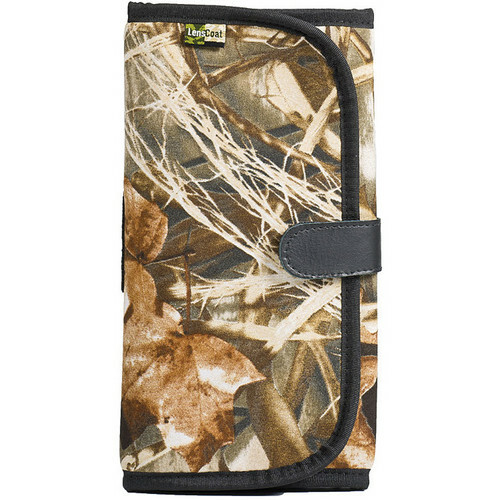 Box Dimensions (LxWxH) 8.9 x 3.9 x 1.5"
FilterPouch 8 (Realtree Max4) is rated 3.9 out of 5 by 18. Rated 2 out of 5 by Jason T from Poor design I have had this for a while and I liked it in the beginning. It is compact and does what it says it is supposed to. However, I am now replacing this due to my dissatisfaction. The pouch itself is actually a great design. Where the issue lies is with the actual pockets that hold the filters. The vinyl sticks to the filters. Not only does this make it slightly annoying to remove the filters, but I have yet to be able to remove a filter, screw it on the lens, and shoot. Instead, the vinyl leaves marks on the filter from the sticking. The process then becomes, lift up the vinyl to unstick from the filter, remove the filter, grab lens pen and clean the filter, attach to lens, shoot. Honestly, I can live with the vinyl sticking. What ruins this product for me are the marks left on the filters from the vinyl sticking. That is the only reason why I cannot recommend this product to anyone. I don't want to take the time cleaning the filters every time I remove them from the filter pouch before I can use them. So, not a bad product in concept, but poor design choice for using vinyl for the pouches. Rated 1 out of 5 by George P. from Left a hard to remove film on filter The individual plastic/vinyal filter holders left a film on the filters that was difficult to remove. I had hoped that the filter holders would keep the filters clean and not actually dirty them up with a hard to remove film. Rated 3 out of 5 by Gustavo J. from Good Size, Vinyl sticks to Filters This product fits nicely into my DSLR case and holds all the filters I need. I'm a little annoyed that the clear plastic vinyl sometimes sticks to the filters making it harder than necessary to remove them. Also, two of the pouches are too small for 82mm filters, but 77mm fits fine. It protects the filters well enough to stuff this pouch in a backpack, run bag, etc. It's good enough that I'll hold on to it until it wears down, but there might be better ones out there. Rated 4 out of 5 by MinAZ from Decent pouch It's a decent filter pouch. I do prefer the Tiffen pouches but there is nothing really wrong with this one. It's rubber coverings do attract finger oils, and the pouches themselves are flimsy so your filters always feel like they might fall out. However, I would still use this if I had to. Rated 3 out of 5 by Mr. D from Didn't Work for me Had a tough time getting 8, 77mm filters in the PVC sleeves especially the two bottom ones. Would work better with smaller filters.Constructed well but Didn't work for me. Rated 1 out of 5 by Ron from Strange top pockets I received an 8-filterLensCoat filter pouch recently. I noticed the top two pockets open to the inside edge instead of the top. To me, this seems like a poor design and the pockets would have been better if they opened at the top with a flap to close the top. This is the design for the other 6 pockets. As it is, the filters can simply roll out the open side of the top pockets. What are the outside dimensions of the pouch? The pouch is a approximately 8.5 x 8.5 .
if filter pouch will hold 8 filters won't the pouch get kind of thick or fat when folded up? When fully packed, the LensCoat FilterPouch 8 will be thicker when folded up, however, as this pouch is designed to fit this number of filters, there will not be any issues in folding the pouch completely. will this fit cokin p filters ? The filter pouch is for circular 82mm filters max. In my experience will not recomend it because the rubber that contains them sticks with the glass.